The Rose City Rollers’ Rosebuds All Star Travel Team at the Junior Roller Derby Association’s Championships in Pennsylvania, after defeating the Duval Roller Dolls in a last-minute upset. Portland, OR – The Rosebuds All Star Travel Team returns from the Junior Roller Derby Association (JRDA)’s Championships ranked sixth in the world. A remarkable achievement, considering the team of 12-17 year old athletes started the 2018 season in 17th place. For some Rosebuds, the Championship tournament started almost as soon as they stepped off the plane with a win over the Chick Whips from Topeka, Kansas, on Friday. The Rosebuds then fell to the Santa Cruz Derby Groms. That loss led to the first major upset of the tournament when the Rosebuds—in the last two minutes of the following game—scored a win over the 5th place Duval Roller Dolls from Jacksonville, Florida. Going into the last two minutes of that game, the Rosebuds were down by one point. That’s when 12-year-old Elsie (“Elsie U. Later”) Stevens—the youngest player on the team—and her teammates took to track. When the final whistle blew, the scoreboard showed the Rosebuds on top with a score of 180-171. The Rosebuds then fell to the FoCo Spartans from Fort Collins, Colordo, after a hard-fought on Sunday afternoon for fifth place. Despite that loss, the Rosebuds’ climb from 17th to sixth place makes them the biggest movers in the JRDA’s 2018 season. 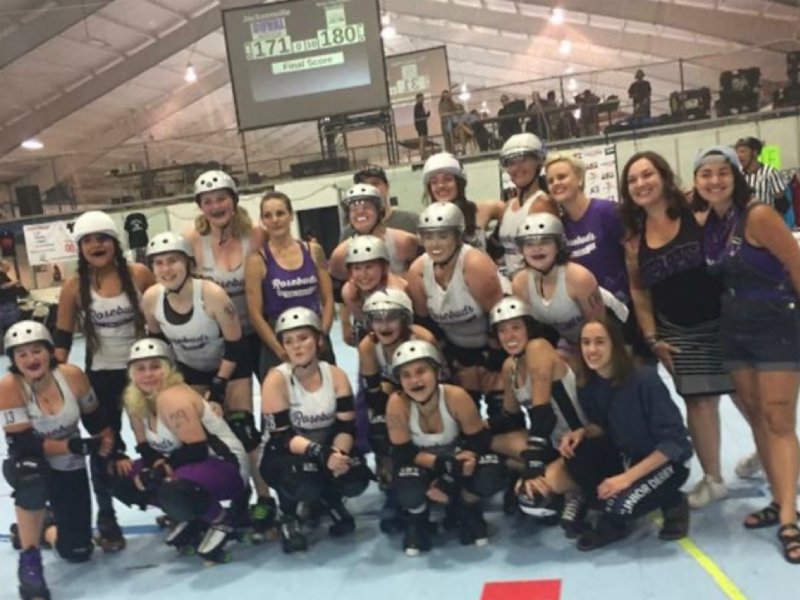 Roller derby returns to Portland in August: on the 17th, the Wreckers recreational league will play against the Jet City Aviators from Everett, Washington. On August 18th, the Rose City Rollers two adult All-Star teams—the Wheels of Justice and the Axles of Annihilation—will take on the Rat City Roller Girls All Stars and the Reign of Terror from Seattle, Washington. Tickets to the games are available through the Rose City Rollers website.